7Bit is an online casino that blends a classic design with the ultimate casino fun. Featuring an astounding range of 700+ games from several world-leading software providers, this place has pretty much everything for a pleasant and hassle-free gaming experience. It’s obvious that 7Bit users who open their accounts in Bitcoin currency are the luckiest as they can get a staggering amount in bonus money from the start. Playthrough requirements are quite fair – the player needs to wager the bonus amount x40 times before the winnings can be cashed out. Other incentives to join 7Bit Casino are regular weekly promotions and exclusive offers for loyal customers. On Mondays you can boost your account with 25% reload bonus, and on Wednesday you can claim up to 100 free spins depending on your deposit amount. Cashback hunters are recommended to play on weekends since their play is backed up with a guarantee of 10% cashback. One more great thing about 7Bit that attracts seasoned players are their Races which last several weeks, alluring players with a tasty prize pools up to 3000EUR. The Races are free to join – you don’t even have to opt in. Simply make real-money bets and you’ll automatically be a fully fledged participant of the tournament. The game menu is varied, with hundreds of slots in all categories to meet the taste of any player. 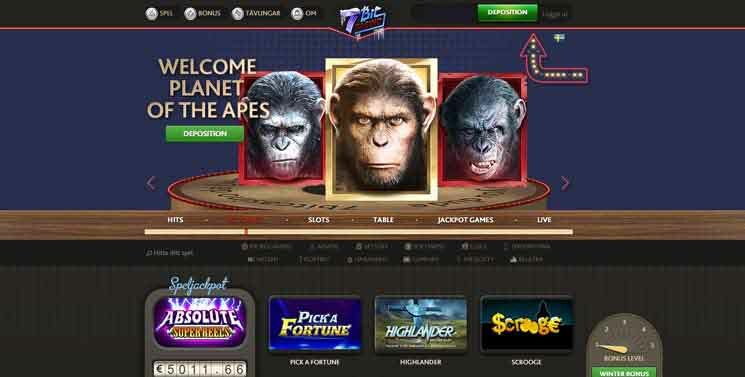 The hottest titles include Planet of the Apes, Gonzo’s Quest, Slots Angels, Treasure Room, and many more. You will find slots from such renowned vendors as Netent, Endorphina, Betsoft Gaming, Microgaming, Belatra, SoftSwiss and a few more. Jackpot chasers will be delighted to find over 40 progressive jackpot titles including Glam Life, Tycoons, Good Girl Bad Girl, Super Lucky Frog, Mr.Vegas, etc. The current jackpot amounts are displayed in a separate block on the game page for users’ convenience. While such a great choice of slots are enough to lure in a typical casino player, 7Bit also offers a vast variety of table games. Live casino games are powered by Ezugi and welcome players to Roulette, Baccarat, and BlackJack tables. 7Bit supports a number of the most preferred payment methods such as credit/debit cards, Skrill, Neteller and Paysafecard. Alternatively, 7Bit players can use any Bitcoin eWallets for making transactions at this classic online casino. You won’t be charged any fees for loading your account. All transaction fees for withdrawals are specified on the Payment page of the website. Supported currencies include EUR, AUD, NOK, BTC and USD.